Saturday Morning Gina and I headed out to the West End markets for brekkie. I love a good market, and despite the rain, the West End markets did not disappoint. Filled with food stalls and clothing shops and fresh produce, the most difficult thing about the markets was deciding WHAT to get! In the end, we gorged ourselves on feta and spinach flatbreads and bought as much fresh fruit as we could carry for breakfast over the next couple days. The fresh fruit here in Australia is second to none! I have never had an avocado so delicious. The apricots are to die for and the mangos are exquisite! Not to mention, they’re usually cheaper than at home! 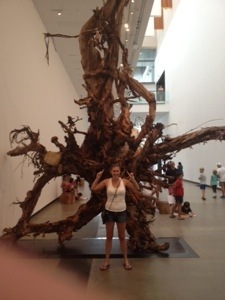 Once we’d bought the entire market out of fresh fruits, we made our way down to the Museum of Modern Art. The day was rainy, so we figured we could do some indoor touristy things for a change. 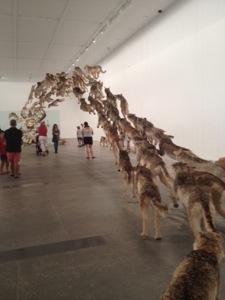 Museums aren’t usually my number one destination when I hit a city, but I actually had a blast in the weird and wacky Brisbane Modern Art Museum. 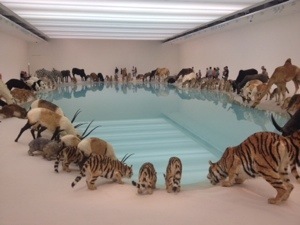 The exhibition that was going on was spectacular. 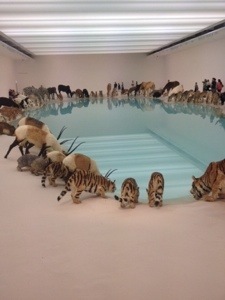 Strange taxidermy style collections of animals round a watering hole. 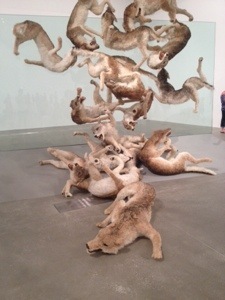 Wolves flying through the air and dead trees that filled the entire length of the museum hallways. There were some stupid things as well. Like a video of two brothers chewing gum set on loop. 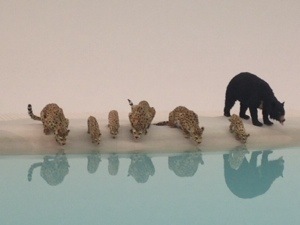 But for the most part we found everything fairly entertaining! 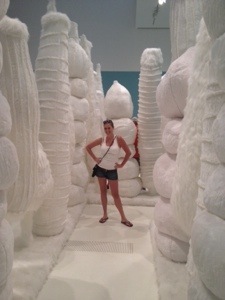 A room filled with Dr. Seuss-like white trees was one of our favourites. Made me feel like I was in a warm and fuzzy winter wonderland! We laughed and stumbled our way around for a couple hours until the sun popped out again. Then we made our way back to Gina’s for a couple beers and to get ready for the evening. The evening’s activities were pre-drinks at Nick’s place with the boys and then out to Ric’s pub in the Valley to watch Nick’s friend’s band Mar Haze play. Not only was the band incredible, and totally laid back in true Aussie style, it was even more fun to catch up with Nick again and relive our African tales. But Australia Day is Jan 26. And this report didn’t go to press till Feb 9. Musta been some party!